Bruxism, or teeth grinding, is a common condition that affects many people. If you grind your teeth, you may experience a headache, toothache, or jaw pain. Since most people grind their teeth at night, many do not realize that they are doing it in the first place. However, a person may notice worn or damaged teeth. In severe cases, a person may suffer terrible pain in the joints that surround the mouth. The American Dental Association reveals that there is no one reason behind teeth grinding. There may be several factors that lead to this habit. Allergies/Ailments– When a child gets sick or suffers from bad allergies, the discomfort may lead him or her to grind his or her teeth. Stress– When a person is under a great deal of stress at home or work, he or she may begin to grind his or her teeth. Abnormal Bite– Is a person’s teeth are uneven, and he or she has an abnormal bite, he or she may begin this habit. Missing Teeth– When an individual has gaps in his or her mouth, teeth grinding may start. After you seek help for bruxism, your dentist will recommend the best treatment. Mouthguard– Wearing a mouth guard is one of the most popular solutions for teeth grinding. It is a device that is worn over over teeth at night and prevents the top and bottoms from coming in contact during sleep. In this manner, it relieves pressure from clenching as well. 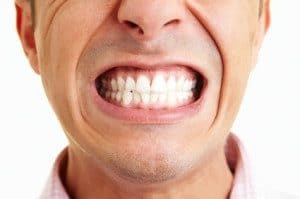 Relaxation methods– If stress is causing you to grind your teeth, it may be advised to practice certain relaxation techniques. Taking a warm bath or listening to soothing music may help to calm your nerves. Over the long term, you may consider yoga or similar meditation methods. Tooth Adjustments– If your abnormal bite is causing problems, your dentist may reshape or reconstruct your teeth. If you find that you are grinding your teeth and want help, schedule an appointment with us today. We are dedicated to his patients’ oral health and will offer effective treatments for the problem.